1990 Mid State Fair Open Bridle Champion. 1993 Split 2/3 - 1993 Reno Open Futurity. 1993 13th - NRCHA Open Futurity. 1997 AQHA World Show Finalist in Cutting & Working Cow Horse. 1998 Arizona Sun Circuit Champion Working Cow Horse. 1999 AQHA High Point Senior Cutting 9th Place. 1999 California Rodeo Open Bridle Reserve Champion . 2000 Open High Point Cutting 6th Place. NRCHA Supreme Reined Cow Horse. Superior Cutting, NRCHA Supreme Reined Cow Horse ROM Cutting, ROM Reining & ROM Working Cow Horse. A limited number of progeny are available for sale. SMOKES MR NIC (IMP) is from legendary bloodlines. People think of Reminic as a reining and reined cow horse sire but he was shown by Greg Ward to 5th in the 1981 NCHA Futurity,won the semi-finals and was the 1981 NCHA Futurity Champion Stallion. Smokes Mr Nic's dam is one of only two mares to produce more than one Supreme Reined Cow Horse. The other mare is her dam Mac's Sujo. They both produced three NRCHA Supreme World Champions Both of these mares has produced numerous Champions from NRCHA World Championship Snaffle Bit Futurity Champions to APHA World Champions. And their offspring have produced Champions in the cutting, reining, and working cow horse. Formerly owned by NRCHA Hall of Fame rider, the late Pat Hubbert, SMOKES MR NIC (IMP) was bred to a limited number of mares due to his owners illness, but still sired outstanding horses such as APHA World Champion SMOKES SUGAR NIC. This may be your last chance to get this legendary California bloodline. 1993 Reserve Champion 3&4 YO SBF; 13th - 1993 NRCHA Open Snaffle Bit Futurity; 1996 Cow Palace Grand National Quarter Horse Show Cutting Champion; 1996 Cow Palace Grand National Quarter Horse Show Working Cow Horse Champion; 1997 AQHA World Show Finalist in Cutting & Working Cowhorse; 1999 AQHA High Point Senior Cutting 9th Place; 2000 Open High Point Cutting 6th Place; NRCHA Supreme Reined Cow Horse. SMOKES MR NIC (SMP) has sired an APHA World Champion Jr. Working Cow Horse and NRCHA money earners, AQHA ROM earners and AQHA point earners, including SMOKES SUGAR NIC, 2001 APHA World Junior Working Cow Horse; Mr Chex Nic, Montana Reined Cow Horse Stallion Stakes Open Futurity - 3rd; Docs Smokinic NRCHA Stakes Non Pro Bridle Champion, etc . By REMINIC LTE $92,650 (NCHA $81,946), NCHA Silver Award; Champions Stallion and winner of semi-finals 1981 NCHA Open Futurity; NCHA Futurity Champion Stallion, NCHA Novice Reserve World Champion. REMINIC is an Equi-Stat All-Time Leading Cutting, Reined Cow Horse, and Reining Sire. 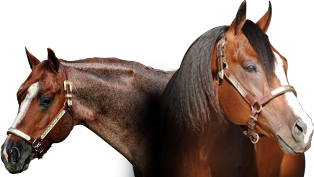 His foals have earned over $2,708,042 (NCHA $651,581) with 6 World Champions winning 9 World Championships. Sire of two NRHA Open Futurity Champions, a NRHA Non Pro Futurity Champion, and more. 1st Dam SMOKES BELLE (by Mr Gunsmoke) NRCHA Supreme Reined Cow Horse, NRCHA Hall of Fame. Dam of SMOKES MR NIC (SMP), NRCHA Supreme Reined Cow Horse; Smokinic (by Reminic) $180,000. Champion NRCHA World Championship Snaffle Bit Futurity, NRCHA Supreme Reined Cow Horse; SMOKES DUDE (by Winnerinic) NRCHA Supreme Reined Cow Horse, APHA Workd Champion Working Cow Horse; Smokes Nic (by Reminic) NRCHA $7,389. 3 x AJQHA World Show Top Ten, 2 x AQHA High Point Top Ten; Sujo's Sunshine (by Captain Joker) Dam of : LITTLE MOONPIE NCHA $139,320, Reserve Champion NCHA Super Stakes; CAPTAIN HAIDA, NCHA $28,794.